Figure 1. The insidious flower bug, Orius insidiosus Say, feeding on a thrips larva. Photograph by Lyle J. Buss, University of Florida. Eggs: The eggs of Orius insidiosus are 0.4 mm long (Green Methods 2016). Adult females deposit eggs within plant tissue (Lattin 1999). 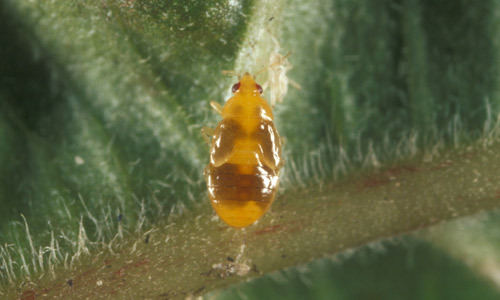 Nymphs: The nymphs of Orius insidiosus are less than 3 mm in length, wingless and teardrop-shaped (Lattin 1999). They range from yellow-orange to brown in color (Wright 1994) (Figure 2). The first instar is slightly yellow and later instars become progressively darker in color (Funderburk 2016). Figure 2. Nymph of Orius insidiosus Say. Photograph by Lyle J. Buss, University of Florida. 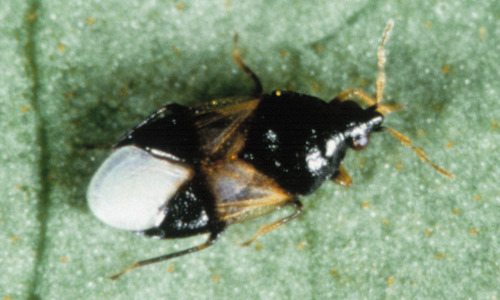 Adults: The adults of Orius insidiosus are approximately 3 mm long (Lattin 1999). They are oval and black with white wing patches. The wings extend beyond the abdomen. Adults have a long proboscis used for sucking plant juices and consuming prey (Wright 1994) (Figure 3). Figure 3. Orius insidiosus Say adult. Photograph by James Castner, University of Florida. Orius insidiosus is commercially available for mass release. Release rates vary among the type of crop and the level of thrips infestation (Silveira et al. 2004). For horticultural crops, release rates of one to two predators/m2 per release are usually used (Sanchez et al. 2000, Silveira et al. 2004). Orius insidiosus is shipped in the adult stage. Commercial producers of Orius insidiosus recommend its use in greenhouses, fields, interiorscapes, orchards and gardens. Baez I, Reitz SR, Funderburk JE. 2004. Predation by Orius insidiosus (Heteroptera: Anthocoridae) on life stages and species of Frankliniella flower thrips (Thysanoptera: Thripidae) in pepper flowers. Environmental Entomology 33: 662-670. Chamber RJ, Long S, Sand NL. 1993. Effectiveness of Orius laevigatus (Hem: Anthocoridae) for control of Frankliniella occidentalis on cucumber and pepper in the UK. Biocontrol Science Technology 3: 295-307. Demirozer O, Tyler-Julian K, Funderburk JE, Leppla, N, Reitz S. 2012. Frankliniella occidentalis (Pergande) integrated pest management programs for fruiting vegetables. Pest Management Science 68: 1537-1545. Frescata C, Mexia A. 1996. Biological control of thrips by Orius laevigatus (Heteroptera: Anthocoridae) in organically-grown strawberries. Biological Agriculture & Horticulture 13: 141-148. Funderburk JE, Stavisky J, Olson S. 2000. Predation of Frankliniella occidentalis (Thysanoptera: Thripidae) in field peppers by Orius insidiosus (Hemiptera: Anthocoridae). Environmental Entomology 29: 376-382. Funderburk JE. 2009. Management of the western flower thrips (Thysanoptera: Thripidae) in fruiting vegetables. Florida Entomologist 92: 1-6. Herring JL. 1966. The genus Orius of the Western Hemisphere (Hemiptera: Anthocoridae). Annals of the Entomological Society of America. 59: 1093-1109. Lattin, J. D. 1999. Bionomics of the Anthocoridae. Annual Review of Entomology 44: 207-231. Reitz SR, Yearby EL, Funderburk JE, Stavisky J, Momol MT, Olson SM. 2003. Integrated management tactics for Frankliniella thrips (Thysanoptera: Thripidae) in field-grown pepper. Journal of Economic Entomology 96: 1201-1214. Ruberson JR, Shen YJ, Kring TJ. Photoperiod sensitivity and diapause in the predator Orius insidiosus (Heteroptera: Anthocoridae). Annals of the Entomological Society of America. 93: 1123-1130. Sanchez JA, Alacazar A, Lacasa A, Llamas A, Bielza, P. 2000. Integrated pest management in sweet pepper plastic houses in the southeast of Spain. IOBC/WPRS Bulletin 23: 21-30. Silveira LCP, Bueno VHP, van Lenteren JC. 2004. Orius insidiosus as biological control agent of thrips in greenhouse chrysanthemums in the tropics. Bulletin of Insectology 57: 1-6. Xu X, Borgemeister C, Poehling HM. 2006. 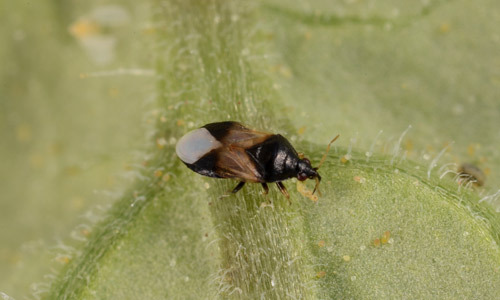 Interactions in the biological control of western flower thrips Frankliniella occidentalis (Pergande) and the two-spotted spider mite Tetranychus urticae Koch by the predatory bug Orius insidiosus Say on beans. Biological Control 36: 57-64.